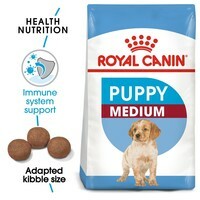 Royal Canin Medium Junior is a complete diet for medium breed puppies up to the age of 12 months old. Made with high quality ingredients including vitamins and minerals, the food will give your puppy the support it requires in the early stages of its development. Digestive Health – An exclusive combination of nutrients to support optimal digestive security and a balanced intestinal flora which also contributes to good stool quality. Mineral Balance (Calcium/Phosphore) – Helps ensure robust skeletal development in medium breed puppies thanks to an adapted intake of calcium and phosphorus. Short Growth/High Energy – Meets the high energy needs of medium breed puppies which have a short growth period. Natural Defences – Helps support the puppy’s natural defences, thanks particularly to an antioxidant complex and manno-oligo-saccharides. Suitable for puppies from 2-12months of age weighing from 11-25kg. Dehydrated Poultry Protein, Animal Fats, Maize, Dehydrated Pork Protein*, Wheat, Beet Pulp, Wheat Flour, Rice, Maize Flour, Hydrolysed Animal Proteins, Vegetable Protein Isolate*, Maize Gluten, Fish Oil, Yeasts, Soya Oil, Minerals, Fructo-Oligo-Saccharides, Hydrolysed Yeast (Source Of Manno-Oligo-Saccharides), Marigold Extract (Source Of Lutein). I have fed this food to my Cocker puppy since bringing him home. I find it best for him slightly moistened and with a little meaty food added. It is initially expensive, but as you don't use so much as some other kibbles, it works out a reasonable price.